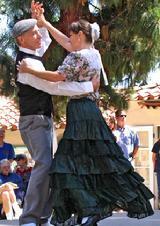 We are a group of San Diego, California dancers dedicated to spreading the joy of vintage social dance through weekly classes, practice sessions, and occasional special dance events. Our focus is on having FUN, and dancing with musicality. 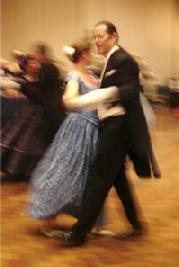 Learn universal partnering skills in a variety of freestyle couple dances from the 1840s to the 1950s, including many kinds of waltzes (our favorites). You'll also learn a few set dances and popular choreographies. We dance to an eclectic mix of music, ranging from authentic period pieces to contemporary compositions. All ages and skill levels are welcome, with or without a partner. Vintage Dance Society to bring various live-music vintage balls, historic-themed dance events, performances, special workshops and master guest instructors to our community. © Copyright 2007-2019 Waltz & Such. All rights reserved.